Red Veil Rummage Sale at Visionary Dance Studio ! It’s a FUNDRAISER FOR VDP STUDIO’s Winter rent and heat! Class attendance has been down due to economic times, so this fund raising effort is essential to the studio’s survival! Very Cool Stuff has been and is being donated by dancers and friends in the Seattle area. Donations are accepted anytime after Oct 31st . Just let us know when you want to drop off. Details at he end of this page. It’s a TWO DAY SALE !!! 2PM- 6:30pm. Stop buy after work! Belly Dance demonstration at 6:00 and refreshments. Belly Dance Demonstration at 4:00 pm. The RED VEIL SALE will be inside VDP Studios where it nice and warm. 1. Recycle stuff back into community! 2. Clean your basement, attic or closet out of stuff you are tired of. 3. 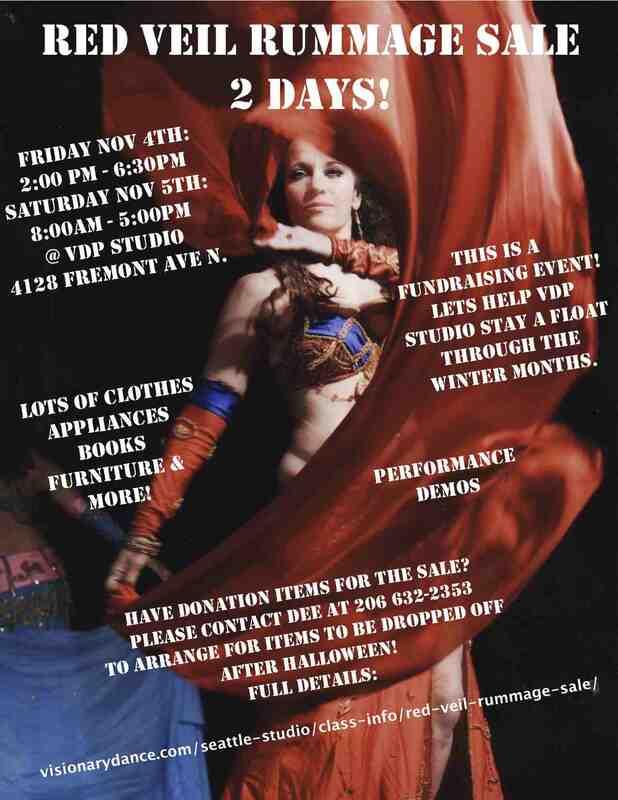 SUPPORT BELLY DANCE ARTS! Yes give things a second life! Yes! Support your local belly dancers! 1. We have been offering a”Belly Dance Stimulus Program” for women with out jobs since 2009. 2. We are the home base for the 7 piece traditional Arabian Music Ensemble, “House of Tarab”; oud, violin, bass, zorna, ney, riq, drums and keys. They play a concert at VDP every Third Fri of the month. It’s awesome! 3. We are the home base of the “Neighborhood Temple Priestess Dance Collective” too. They do community out reach benefitting women’s lives though the sisterhood of sharing women’s dance and by way of their dances as tools for community celebration. 4. We are in the process of changing into a non profit arts organization that’s goals are to provide classroom, rehearsal and performance space for belly dancers, musicians and related artists. It is also the goal to eventually create grants to assist artists do their very best work with quality tools and resources as well as help with health care issues. We feel artists are too often the last to be considered when it comes to benefits. We have a ton of nice mens clothes that have been donated. So bring your man. We will have lots of crazy stuff and costumes for sale! We will post a list of some of the stuff online if we have time. Lots of inexpensive used things, some new items in the shop and a few rare collector items! If you have a costume you want to sell call or email and we can have you participate. 206 632-2353.
we need small furniture, appliances in working order, books, sellable clothing, linen, sports equipment tools. . . . No mattresses, pillows, or things we can’t take to to good will if we can’t sell them.